Hyder Husain Arastu 2 years, 1 month ago. Galaxy Nexus Nougat ROM is available through unofficial AOSP ROM update and this is a guide which explains how to update Galaxy Nexus to Nougat ROM. Galaxy Nexus is otherwise known as tuna and hence this is for Tuna Nougat ROM (maguro, toro, toroplus nougat rom). As always this Nougat ROM for Galaxy Nexus is brought to you by developer Ziyan, MWisBest and Hashcode. Although the Galaxy Nexus is 5 years old device but the unofficial Nougat ROM is quickly released by these developers. THIS IS JUST A BETA ROM AND MAY BE USED AS A DAILY DRIVER SOFTWARE. CHECK THE WORKING AND NON-WORKING LIST BEFORE FLASHING AND PROCEED AT YOUR OWN RISK. Installing a custom ROM on a Galaxy Nexus device requires the bootloader to be unlocked and a custom recovery to be installed on the Galaxy Nexus phone, which may VOID your warranty and may delete all your data. Before proceeding further you may consider backup all data on the phone. You are the only person doing changes to your phone and I cannot be held responsible for the mistakes done by you. 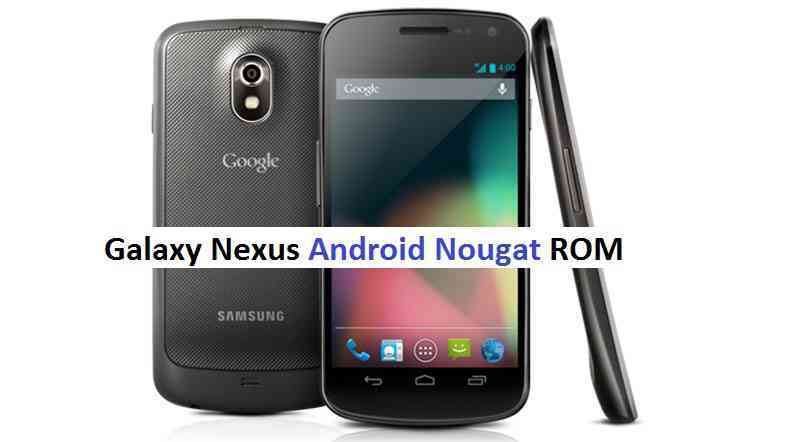 Download the Galaxy Nexus Nougat ROM zip file and a suitable Nougat Gapps zip file from the above download link and copy both the files to phone. – Power off the phone and keep pressing key combinations: Power Button + Volume Down while turning on your Nexus. First flash the Galaxy Nexus Nougat ROM ZIP from device. Reboot the phone after the flashing is done completely. Do the initial setup and enjoy the Nougat ROM on Galaxy Nexus. If you have any concerns or are you facing any problem following this guide or post installation then just login and leave a comment to get an instant reply. Stay tuned or Subscribe to the Galaxy Nexus forum For other Android Nougat ROMs, CyanogenMod 14 ROMs, other ROMs and all other device specific topics. I like to activating dark theme, but I do not know how. The only problem that i have faced is that it shuts down around every 3 minutes and will not turn on unless i remove the battery and put it back in.